Plans to arrive early at the Virginia State Conference, Judith Surber State Regent, rapidly deteriorated as a spring blizzard caused cancelled and delayed flights for two days. Finally I drove from Northern Virginia after a late night flight created an overnight opportunity. Arriving in time for a morning workshop, the welcome of the Virginia Daughters made me soon forget the hassles of travel and I had a wonderful visit. 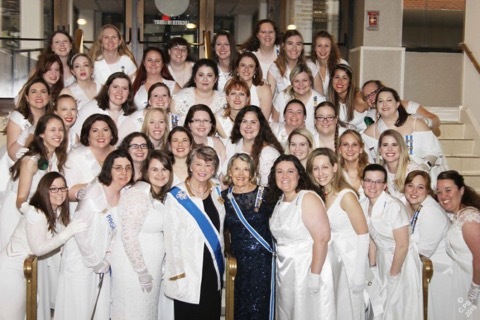 The Virginia DAR State Conference (March 14-17, 2019) opened with suspense: with torrential storms slamming the western and central states, would President General Ann Turner Dillon be able to make it out of Denver? Would Christina Bannon, National Vice Chair of the America 250! Membership Task Force, beat the storms out of Chicago to give her workshop on Friday? President General location updates punctuated Thursday’s administrative committee meetings. The evening’s welcome reception was followed by a later champagne celebration for “We the People” chapter regents and “Liberty Belle” donors to the State Regent’s Project, the underwriting of a conference room in the Center for the Constitution at James Madison’s Montpelier. Friday morning the six visiting state regents—Holly S. Blair, Massachusetts; Wendy Stanley Jones, New Hampshire; Karen F. Stroever, New Jersey; Nancy L. Zwetsch, New York; Nancy Schirm Wright, Ohio; and Carol P. Schwenk, Vermont—were welcomed at the State Regent’s Private Breakfast. Meanwhile, the Cameo Club hosted a breakfast with a “Hats Off to Judy!” fashion show, complete with outlandish hats, giggles, and fun. After breakfast, attendees chose between two concurrent workshops—a panel discussion on “How to Safely and Effectively Use Social Media” or “Got AIRs? The Genealogical Proof Standard” with Christina Bannon—followed by a screening of The Hello Girls, a documentary about the 223 women sent to France in 1918 as telephone operators in the Great War. The State Officers’ Club meeting and luncheon had the welcome surprise of Mrs. Dillon, finally safely arrived in Richmond. She explained that the Colorado “bomb cyclone” (similar to a nor’easter) had resulted in two canceled flights and a three-hour delay on her third flight before she could get out of Denver. The afternoon Memorial Service honored the 163 Virginia Daughters and Virginia-resident Members at large. The Opening Night Banquet featured an inspiring keynote speech by Mrs. Dillon followed by the presentation of seven C.A.R. Debutantes. The Outstanding DAR Service for Veterans Volunteer, Outstanding Youth Volunteer, and Outstanding Veteran Volunteer award winners were announced, along with the 2019 Virginia Outstanding Junior. The evening concluded with a reception honoring the President General, the visiting State Regents, and the C.A.R. Debutantes. Vermont State Regent Carol Schwenk spoke on “What Is a Junior?” at Saturday’s Junior Breakfast, shortly before the visiting State Regents departed for a tour of historic Richmond areas. The business sessions included the presentation of the State Officer nominees, with voting during the lunch break. It was announced that Virginia Daughters had raised $216,000 for the State Regent’s Project, with more to come from later sales of the book Buddy and the Chickens. The original target for the Montpelier project had been an ambitious $200,000. We were fortunate to have Mrs. Dillon still with us to present certificates during the Chapter Awards Luncheon, which included 58 New Members and New Horizons course graduates and more than 85 other awards. 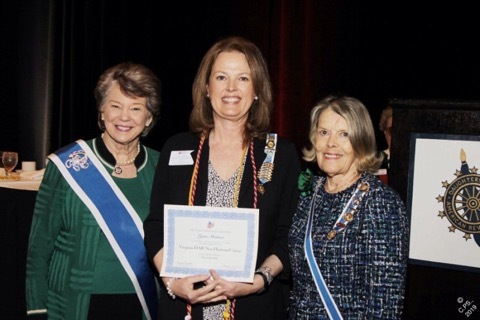 The Virginia Daughters also presentated an award for her 30 years of DAR membership. 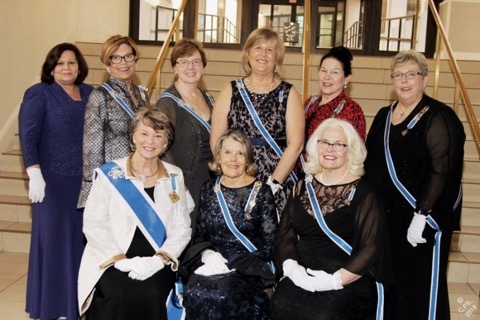 Saturday night’s banquet honoring chapter regents included a check presentation to Montpelier Foundation, the Outstanding Chapter Regent award, and brief reports from Virginia’s 129 chapter regents. #TBT 125 years ago, on April 19, 1894, the Sequoia Chapter in San Francisco, California, planted a �... 19 hours 36 min ago.